Harmer Drainage’s range of floor (left) and roof drains. Harmer Drainage – a group member of Alumasc Exterior Building Products (Alumasc) – has introduced Level Two building information modelling (BIM) content for its industry-leading SML range of soil and waste pipework, in keeping with its commitment to providing the best products and services to the market. The well-established SML lightweight cast iron soil and waste system remains one of the most specified systems for high-demand applications such as public buildings, schools, colleges, high-rise office blocks and healthcare facilities. The pipework system range is now BIM Level Two compliant, with 3D BIM data objects currently available via the Harmer Drainage website or the BIM store. Talking about the introduction of BIM content, Chris Lister, business development manager at Alumasc, says: “Our BIM content offering responds directly to the (UK) government requirement that all of building projects must be BIM compliant by 2016. We’ve also listened carefully to our architectural engineering customers who’ve told us of their need for solutions which make their computer-led designs more robust. By introducing BIM, Harmer Drainage says it has set the ball rolling towards building its own digital product library online. In addition to the SML range, Harmer’s floor and roof drainage products currently offer BIM Level One compliance, offering full BIM compatibility when the 2D and 3D images and support documentation are combined. These ranges will be upgraded to Level Two compliance by 2016. Lister says BIM offers the construction industry the opportunity to bring together all components of a building’s design in one place through digital modelling. BIM data can be used to illustrate the entire building life-cycle and, by integrating different aspects of the design more effectively, reduces the risks of mistakes and discrepancies during specification. Harmer’s SML range is manufactured in Germany to meet the highest quality and performance standards. It also carries British Board Agrément Certification, 05/4191. The pipes and fittings meet the European Standard BS EN 877, further assured by CE marking, showing full compliance with EU manufacturing, testing and technical performance requirements. “SML has also secured British Standard Kitemark certification, further confirming that the products are manufactured in accordance with EN877:1999 +A1:2006 and quality controlled under ISO9001:2008. The British Standards Institute which issues the award carries out rigorous checks to ensure that products are worthy of the BS Kitemark stamp,” Lister adds. Alumasc provides premium products for building exteriors and drainage backed up with high levels of technical expertise and project support. Its Harmer Drainage is a leading brand in the building drainage market, representing over 40 years of drainage innovation. Built on the philosophy of continual development, the Harmer range is constantly evolving to suit the ever-changing demands of the marketplace. It includes the Harmer Floor Drain, a well-established range which has received extensive development and recent re-launch. It has long been the product of choice for high-demand applications and has been extended to include cast iron, stainless steel and aluminium, making it the most comprehensive floor drainage range on the UK market. “Cast iron is ideal for plant room and other industrial applications where an asphalt or composite floor exists. Meanwhile, the new stainless steel range is a versatile high-performance drainage solution, featuring floor drains, channel drains and shower and wet room drainage, whilst the aluminium floor drain range, provides effective and attractive interior drainage solutions, in nickel, bronze or satin stainless finishes,” says a company spokesman. The brand also offers the Harmer roof drainage range, which provides a single source of innovative drainage solutions with a comprehensive range of materials and product permutations to allow maximum flexibility for architects and specifiers. 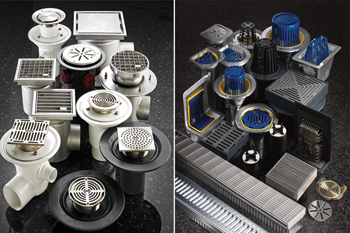 The range consists of aluminium, cast iron, stainless steel and insulated polyurethane outlets. To support the ongoing product development, Alumasc’s dedicated Harmer team has been further enhanced by the appointment of additional drainage specialist area sales managers, and a new technical manager. More recently, Steve Durdant-Hollamby joined Alumasc Rainwater and Harmer Drainage as managing director.